Donald McInnes, world famous violist and teacher, is known in virtually every corner of the artistic world for his appearances with major orchestras, recitals, chamber music participation, and numerous master classes. His affiliation with major schools throughout the world has included the Universities of Michigan, Cincinnati, and Washington. In 1985, he accepted the appointment as Professor of Viola at the University of Southern California (the position previously held by his teacher, the famed William Primrose). 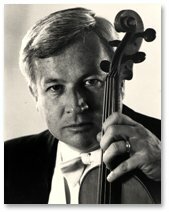 Although retiring from public performance in 2009, he maintains a very busy schedule with his class of viola students from throughout the world. In addition, his schedule is filled with invitations to judge major competitions and give viola and chamber music master classes. He has appeared as soloist with such orchestras as the New York Philharmonic, Boston Symphony, Orchestra Nationale de France, Pittsburgh Symphony, Zurich Chamber Orchestra, CBC Chamber Orchestra, Toronto Symphony, Seattle Symphony, Oregon Symphony, Calgary Philharmonic, and the National Symphony UNAM Philharmonic of Mexico. His career includes close associations with such artists as Leonard Bernstein, Yehudi Menuhin, Lynn Harrell, Paul Tortelier, Yo-Yo Ma, Brooks Smith, Martin Katz, Janos Starker, Marilyn Horne, Warren Jones, Menahem Pressler, and many other leading artists of our time. Mr. McInnes has been an active recording artist who can be heard on Columbia, RCA, Deutsche Grammophon, Angel(EMI), etc. During the fall of 1999, a re-release of his famous recording of Berlioz’ Harold in Italy with Leonard Bernstein conducting became available. The Penguin Guide to CD’s ranked this recording as follows: “Donald McInnes is a violist with a superbly rich and even tone. His first entry, with the phrase echoed, is a ravishing moment and he responds at all times to the conductor, yet has plenty of individuality. This recording goes to the top of the list of available recordings.” Also, Mr. McInnes’ most recent CD has been released on KLEOS Classics and includes works of Loeffler, Hindemith, and Suderburg. He has introduced many new works for viola including commissions for him by such leading composers as William Schuman, William Bergsma, Robert Suderburg, Vincent Persichetti, Paul Tufts, and Thomas Pasatieri. Until recently, he regularly appeared at leading music festivals in North America and abroad such as Banff, Marlboro, Gstaad, Sunflower, St. Barths, Buzzard’s Bay, Ambler, Interlochen, and the International String Workshop. For many years, he has spent his summers at the Music Academy of the West in Santa Barbara, California where he maintains an international class of young violists. Today, his students can be found winning important competitions, in leading orchestras, and teaching at many of the finest conservatories and universities. Mr. McInnes was honored as the 2004 National Artist Teacher of the Year by the American String Teachers’ Association, and, this year, he received the Silver Alto Clef Award, the highest award presented by the International Viola Society. Recently, he was also honored by USC, the Music Academy of the West, and the Camerata Pacifica with a “Lifetime Achievement Award”. Below you will find the complete list of scores edited by Donald McInnes.